The curtains sweep open with Moonlight, Jessie Chung appears on stage and stuns the crowd with short, bouncy hair and an elegant winter dress! To raise funds for cancer patients, Jessie Chung continues to showcase her skills on stage after the 7th showing of her Exquisite Chinese Orchestra Concert. Under the guidance of director Brian Choot and with the cooperation of old and new actors alike, Moonlight, an extremely challenging stage production, was brought on stage to the audience. The script of Moonlight combines classic Chinese and English literary art works with Jessie’s views and experiences regarding love. Jessie Chung takes on the leading role in this drama as the main actress, while Marcus Choot, the lead actor of The Quatrain of Seven Steps, is the first lead actor, and Tylor Chen, the lead actor of Unchanging Love and an actor in Kungfu Taboo, acts as the second lead actor. Jessie Chung’s character Yang Xiao Fan is a vivacious, lively girl. The previously outgoing, joyful girl experiences the ups and downs of life after having a taste of love, which alters her personality forever. The innocent and cute Yang Xiao Fan begins to oscillate between two men of different types. However, things get worse from there; she accidently finds out about her dreadful background, which throws her into disarray with her family relationships, rendering her helpless. The complex emotions in the play gives Jessie Chung a chance to show her acting skills. 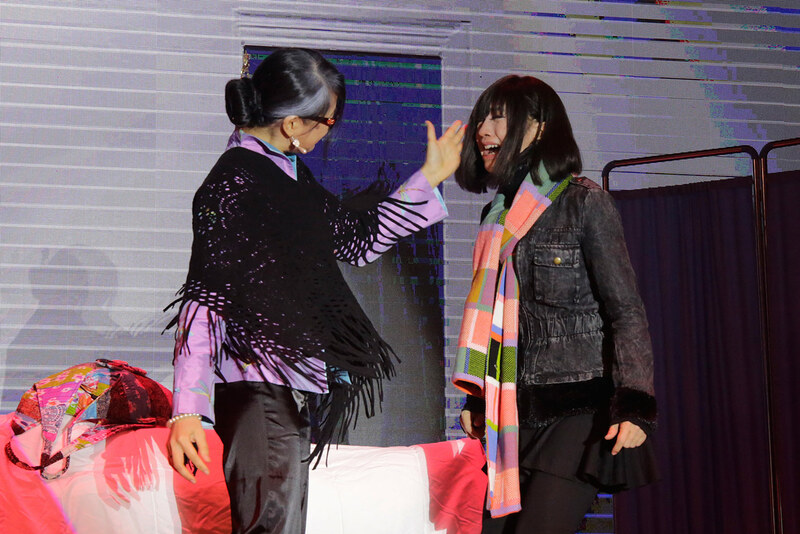 For the sake of art, Jessie Chung went all out on stage with Li Zi Heng (portrayed by Marcus Choot), the one who loves her and Wang Jun Hao (portrayed by Tylor Chen), the one whom she loves; kissing scenes were quite prevalent, and Jessie’s character was slapped by her two lovers. During a hospital scene, she was brutally beaten up by Mrs. Lee (portrayed by Joel Lai); the force knocked Jessie back as she fell to the ground with the partition, all of this gave the crowd a huge surprise. The actors and actresses on stage placed themselves into their characters, affecting the mood of the audience. Some of the audience were even moved to tears as they followed the story. Love, hate, family, morality, responsibility are all mixed into the storyline, absorbing the whole audience within the rise and falls of the plot. The stage play also incorporates realistic sound effects to enhance realism, allowing the audience to immerse themselves within the story. Jessie Chung stated that she has fallen into a love triangle before in real life. As the curtains of Moonlight fell, a quote from Jessie Diary appeared for the audience to muse upon: “the person whom you love the most may not be the most suitable one for you, but the most suitable one for you, will become the person whom you love the most”. The stage production is organized by Symphony Musical House, directed by Brian Choot, and produced by Joshua Beh. The team uses an LED stage to display vivid sceneries and high-quality audio equipment to give the audience an impressive visual and audio experience. The organizer also sold Moonlight souvenirs that night for charity, and all proceeds will be going to the Dr. Jessie Chung Cancer Fund. After its debut show, the emotionally stirring stage production Moonlight received an overwhelming wave of positive comments. The organizer has currently decided to start a nationwide tour with fourteen showings of Moonlight.